A grant from the California State Treasurer is offering money to match contributions to college savings accounts. 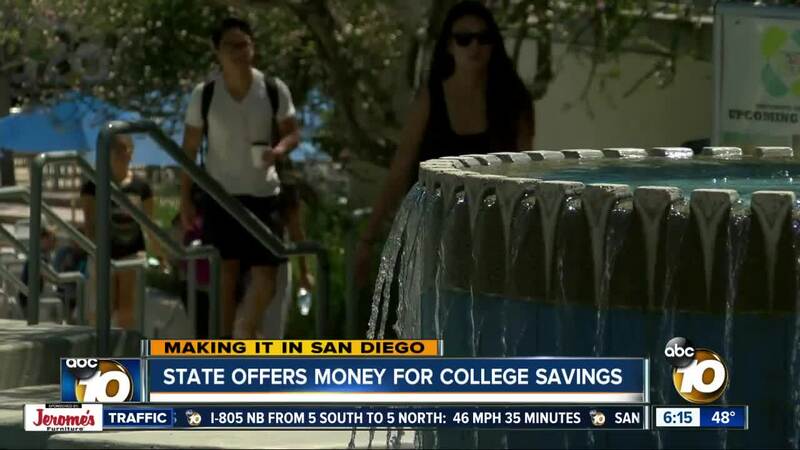 SAN DIEGO (KGTV) - A program through the State Treasurer's office is offering free money to parents who start saving for college education for their children. For the second straight year, the Matching Grant Program will give low to middle-income families in California up to $225 for a 529 account opened through the state's ScholarShare 529 exchange. Families making less than $75,000 are eligible. "Every dollar saved is one dollar less they have to borrow when their child is ready to go to college," says Julio Martinez, the Executive Director of the ScholarShare Board of Investors. A 529 account is money put away that can grow tax-free. It can only be used to pay for school, primarily college or other secondary education. Under the Matching Grant Program, the state will match up to $200 that the family saves during the first year they open an account. Additionally, if the parent establishes an automatic contribution of at least $25 per month, the program will add another $25 to the match. While it may not sound like much, Financial Planner Dennis Brewster from SagePoint Financial says it can grow over time. "It is very tough to beat," Brewster says of the 529 accounts. "The government went out of their way to make it as advantageous as they could to encourage education." Brewster ran the numbers for us. If a family started with a $200 contribution and got the full match from the grant, then added $25 every month for 15 years, the account would grow to $7,400 with just a modest 5% return on investment. If the return was 7%, the account could grow to $8,800. While it may not seem like a lot of money, or enough to pay for all the expenses that go along with higher education, Brewster says the program is designed more to get people started. "They're trying to get people to understand how important that education is for somebody and they're doing what they can to help encourage it," he says. Martinez adds that any amount of savings, even less than $500, makes a child three times more likely to go to college than a child who has no savings at all. "It establishes an expectation and a sense of optimism that there is a plan in place," he says. Here are the eligibility requirements from the State Treasurers office: "Participants must be California residents, be the parent or legal guardian of the beneficiary, have valid Social Security Numbers or Federal Tax Identification Numbers, and earn $75,000 annually or less. The beneficiary of the account must be 14 years of age or younger."